Hiking is a trifecta for me. I get to exercise my somewhat rotund body. I get to see beauty in the form of mountains, trees, animals and flowers. And best of all, I get to spend lots of time with my son. That is him to the right. A fine strapping lad by the name of Benjamin Briggs. If you want to go hiking utilizing only hiking gear made by members of our extended American family, you can do it. I’m here to show you how. 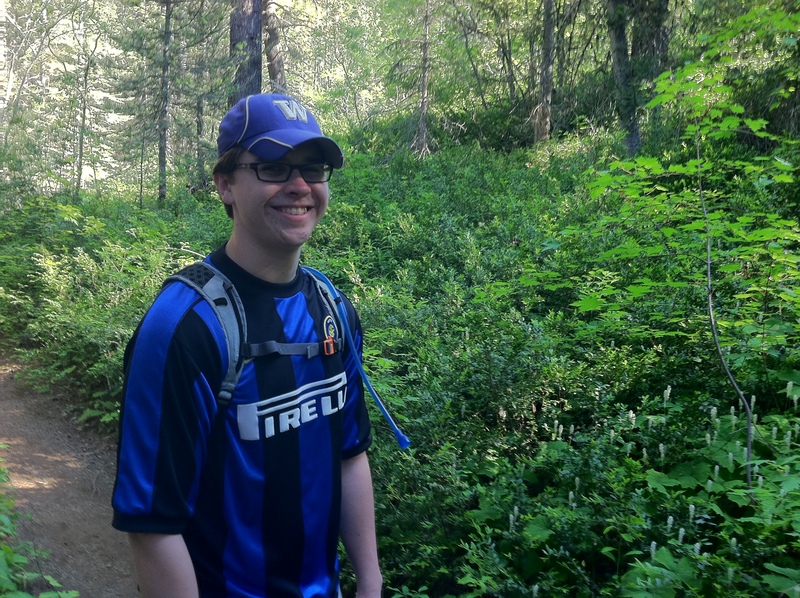 Ben and I have been hiking together since he was about six, but it is only in the last three years that he has really gotten the hiking bug. Last weekend, for the first time in my life, I was actually awoken by my son telling me to get out of bed so we could head out for a hike. And what a hike it was! We went to Teanaway Ridge east of the Cascade Mountains. The weather was perfect and the wildflowers were out in force. We also saw thousands of butterflies supping on the aforementioned wildflowers. 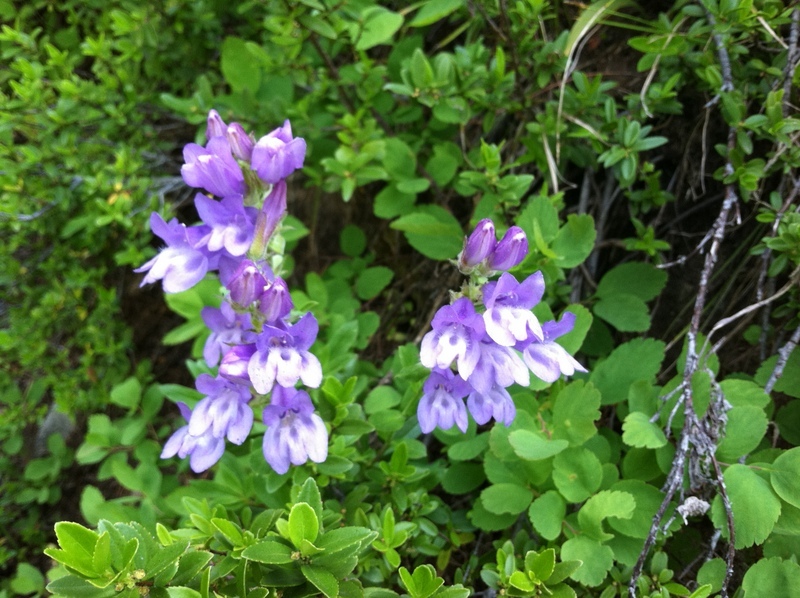 And quite a few hikers enjoying the aforementioned butterflies and wildflowers. Hiking and other outdoor activities is big business; Americans spend $325 billion per year of outdoor recreation sales (gear and trips combined). That is more than what we spend on power generation and supply and legal services. Take my word for it, the less we spend on legal services the better. If you want to make sure that the money you spend on outdoor gear helps to provide employment for members of our extended American family, I can help you do that. Are you ready? What follows is a list of some of my favorite U.S. made hiking/backpacking gear from the ground up. There is no piece of hiking equipment more important that good boots. A ten-mile backpack in a crappy pair of boots is not a lot of fun. We need to get Ben some new boots and we will probably stay close to home and buy him a pair of Danner Boots made in Portland, Oregon. Danner has been making boots since the 1930s. They have a great recrafting program for old pairs of Danners. Watching Danners being made by members of our extended American family is great. 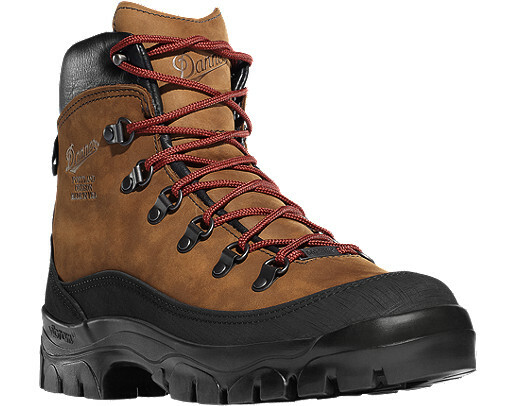 Danner’s Crater Rim boots just won Outside Magazine’s 2012 Gear of the Year award. 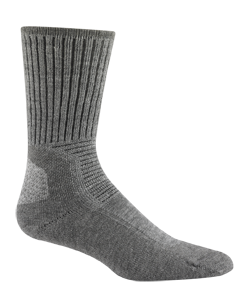 You have a wide range of U.S. made hiking socks to choose from. My favorites, not surprisingly, are Wigwam hiking socks. You can’t go wrong with a pair of Wigwam’s Hiking/Outdoor Pro socks. There are not as many U.S. made packs as I would hope to see, but there are some packs made by our extended American family out there. For a daypack, try Green Guru’s Spinner Recycled Bike Tube backpack. You will get a nice pack and know that you have lessened the volume of discarded biketubes fouling some river. For backpacks, two options are the Gregory Denali Pro 105 or the Kifaru Timberline. The Timberline looks pretty cool. Wander into an REI and you will find a plethora of sleeping bags and they all seem to be imported. But it doesn’t have to be that way. Instead, you can walk about a block from the REI flagship store in Seattle and buy a bag from Feathered Friends. 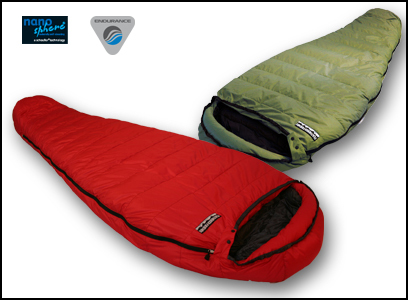 For about $400 you will get a custom sleeping bag that will last you twenty years. 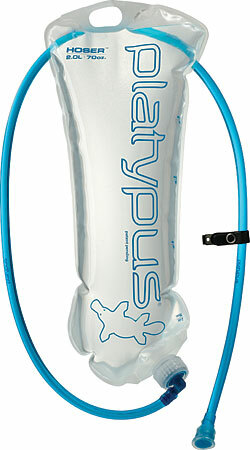 Get cold in your feet after a long day of backpacking? Just tell your Feathered Friends and they will put in extra down to keep your tootsies warm. I have my eye on the swallow. Even a Feathered Friend bag can be improved; by pairing it with a Therm-a-Rest mattress. 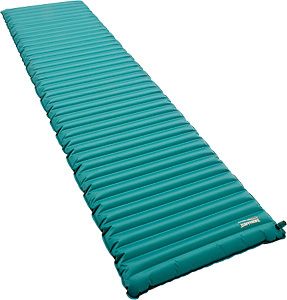 I just picked up a Therm-a- Rest Neo Air Trekker at the REI sale. 2 1/2 inches thick, this baby is going to make my upcoming overnight backpack to Rachel Lake a lot more comfortable. And it is made right here in Seattle. One of the magical things about hiking is how wonderful food tastes after a long all day trek, even if the food is freeze-dried. 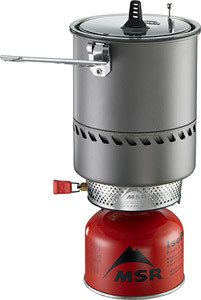 A great backpacking stove is made by members of our extended American family who work at MSR. The Reactor by MSR is outstanding. The business end of the stove is enclosed in a heat exchanger which allows the Reactor to boil a liter of water in three minutes and ensures that the burner never blows out in the wind. The Stove and fuel stow inside of the 1.7-liter pot thereby taking up less precious space in your pack. The Reactor is awesome. Backpacking without enough water is very ill advised. First, you have to filter the water from the stream. Failure to do so can lead to you contracting Giardia, a very unpleasant little malady. 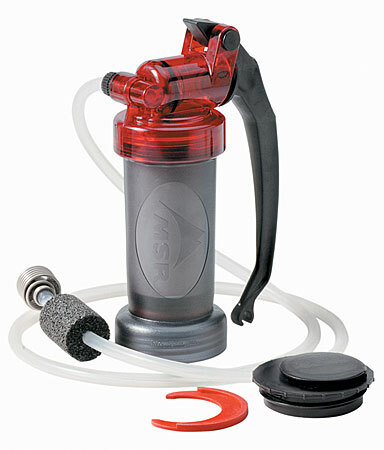 Ben and I use an MSR MiniWorks microfilter that works really well. 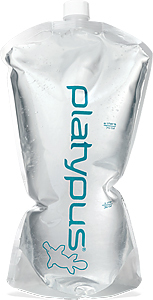 I have become a great fan of hydration packs and Cascade Designs, which also makes Therm-a-Rest and MSR, has a great hydration vessel called the Platypus Hoser. Cascade Designs also makes water “bottles” that once emptied can be rolled up empty in your pack for the trip home, thereby saving space in your pack for souvenirs like gold nuggets discovered in the lake bottom at the end of a long day’s backpacking trip. I am not aware of a lot of American made tents on the market. One firm still in business is Stephensons. They make the Warmlite. If you know of any others, please leave a comment. I sleep in my Dad’s old Moss tent. Every time I sleep in it, I think of my dad. He died twelve years ago, when Ben was only five. Unfortunately, the two of them never got to go on a backpacking trip together. But I got to backpack with my dad, and now I get to backpack with my son. I am the bridge between the two of them, and I am lucky for it. I encourage you to get out on the trail. Hiking and backpacking are wonderful, healthy, spiritual endeavours. 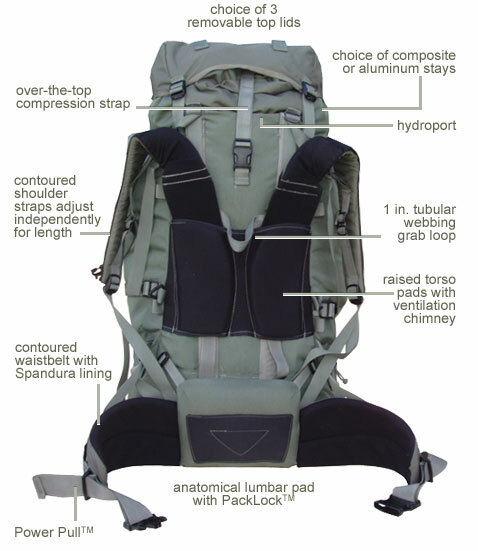 And you can support members of our extended American family by purchasing the gear they make for your expeditions. Wow, that is a win-win proposition! 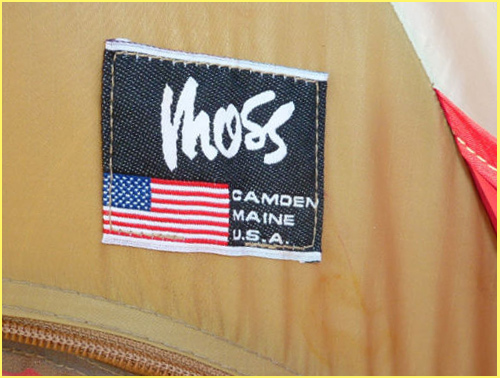 This entry was posted in american made, Hiking, Made in America, made in usa, recreation, socks and tagged backpacking, Danner, Hiking, Hiking equipment, Made in America, made in america products, Made in the USA, Made in the USA products, Moss tents, MSR, Platypus, Sleeping bag, Therm-a-Rest. Bookmark the permalink. It was great that you found an American made tent. -Jack A. Very cool finds! I have had a few readers asking for some made in USA outdoor gear recommendations, and it just isn’t an area I have any experience with. I will be sure to share these resources. I am glad you found my post useful Sarah. Thanks for stopping by for a visit. I have a friend that loves to camp.So this past Christmas i got him an Estwing camping hatchet.I got him the one with the old fashioned handle. Needless to say, he loved it!